New homebrewers are no different from other hobbyists; they’re chomping at the bit (foaming at the mouth?) to get started with their hobby. Although this enthusiasm is good, jumping headlong into the unknown isn’t. Before you start shopping for homebrewing supplies, locate a local homebrew-supply store. Start with an Internet search of “Beer Homebrewing Equipment and Supplies.” Call or stop in a store and ask for a catalog and price list if the store offers one. Look at the equipment and supplies and ask questions about the stock, especially the ingredients. If you’re not fortunate enough to have a local homebrew-supply store, you can just order what you need over the Internet. A simple search on “Homebrewing supplies” nets you a wide range of sources. What you need to get going isn’t exotic. Forget any preconceived notions about shiny copper kettles and coils taking up the entire kitchen or huge wooden vats bubbling and churning in the cellar — such are the product of a vivid imagination. This whole process is much more like baking bread. Starter equipment kits, found at your local (or online) homebrew shops, can range from bare-bones to top-of-the-line quality; you can find good ones for less than $200. Before buying a kit, consider your needs and what you’re willing and able to spend. An airlock is an inexpensive but simple, efficient way to allow carbon dioxide to escape from the fermenter without letting any air in and compromising the hermetic seal of the lid. Cost: $2 or less. A bottle brush is an important piece of equipment. You need a soft-bristle brush to properly clean inside the bottles before you fill them. Cost: $4. A bottle capper affixes the fresh caps to the just-filled bottles. A bench capper is free-standing and can be attached to a work surface, leaving one hand free to hold the bottle steady. The two-handed cappers can be tricky to use if nothing is holding the bottle steady. Cost: $12 (two-handed) to $35 (bench-type). A bottle washer is a curved copper apparatus that threads onto a faucet. Cost: $15. Look for heavy, returnable bottles, without a threaded opening (a bottle crown can’t seal properly across the threads). You need enough to hold 5 gallons of beer. Bombers (22-ounce bottles) are popular with homebrewers. Cost: Cost of retailer deposit, or up to $28 per case if purchased, depending on the style. You need an HDPE (high-density polyethylene — food-grade plastic) plastic vessel on bottling day. Cost: $14. A bottling tube is a long, hard plastic tube with a spring-loaded valve at the tip. Cost: $3. A brew spoon is a stainless steel or plastic spoon with a long handle — 18 inches or longer. Cost: $4 (plastic) to $8 (stainless steel). A brew pot is a stainless steel, aluminum, or enamel-coated metal pot. Cost: $25 and up. A flexible plastic hose is an important, multifunctional piece of equipment used to transfer beer from bucket to bucket or from bucket to bottle. Cost: $0.50 to $0.75 a foot. 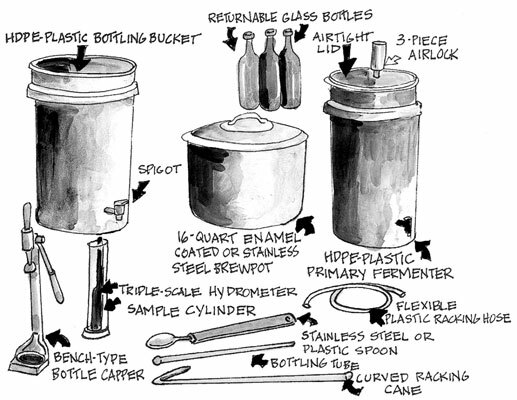 A primary fermentation vessel is a plastic bucket in which to pour cooled wort shortly after the brewing process. It must be sealed airtight for the duration of the fermentation. It must have a 7-gallon capacity to accommodate a 5-gallon batch of beer and still have room for all the vigorous bubbling action and yeast build-up (barm) of the fermenting beer. Cost: $18 with lid. A rubber stopper fits over the stem of the airlock or bubbler to act as a sealed wedge when the airlock is inserted into the hole in the fermenter lid. Cost: $2 or less. A triple-scale hydrometer is a device used to determine the gravity of your brew, which, in turn, allows you to calculate the alcohol content. Cost: about $15 for both.